What is a bagging scale? A bagging scale is a piece of equipment that weighs and dispenses a specific amount of dry bulk material (powder, pellet, granule, etc…) into an open mouth bag. 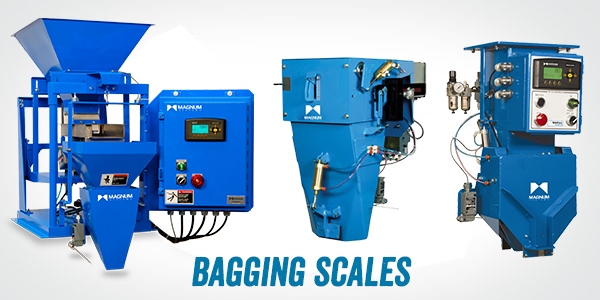 Depending on the application and product characteristics, the bagging scale will utilize one of four main material metering methods, use the bulk and dribble feeding technique and operate based on net-weigh or gross-weigh functionality. The goal in determining which metering device to use is based on what will transfer the material in the most consistent manner. The more consistent the material flow, the easier it is for the controller to decide which step to take to achieve accuracy and speed. Knowing flow characteristics of various products is invaluable when designing a project and Magnum Systems through its Taylor Products and Smoot brands has more than 105 years of experience, application knowledge, and material handling expertise. Gravity bagging scales use the flow characteristics of the product to fill the open mouth bag by use of cutoff gates. These gates close when the bag has reached the desired weight. Free flowing granular products such as grains, fertilizer, salt and small pellets are packaged using the gravity method. Vibratory feeding scales utilize side-to-side movement of the vibratory tray to transfer the product into the bag. These scales use varying vibratory speeds to move difficult materials or provide precise, accurate measurements of granular material. Materials that do not flow easily or have irregular shapes such as ground coffee, light density grass seed or granola usually incorporate vibration with open mouth bag fillers. Belt feeding scales are used for packaging material that tends to stick to itself during the fill process. The belt feeder uses adjustable product height and speed settings to deliver the product into the open mouth bag accurately. Sweet molasses based cattle feed, mulch and topsoil are bagged on belt feeder units. Screw feeding scales transfer dry materials volumetrically either horizontally or at an incline through the scale into a bag. A variable speed drive on the screw feeder along with the shut of gates on the scale allow for bulk and dribble feeding cycle to ensure accuracy. Various powders and granules from flour ingredients to asphalt can be metered with a screw. Most open mouth bagging scales utilize the bulk and dribble feeding method. Bulk and dribble feeding follows the same principle as gravimetric feeders; filling fast to nearly the target amount, and then filling slow to achieve accuracy of the last 10-20% of the target amount. Each bagging scale utilizes two gates. The first portion of the bulk operation is filling with the gates completely open. Then the dribble portion is achieved by partially closing the gate opening to hit the desired target fill. When using a screw to meter material, like the APO Dual, it uses two different sized augers – one large and one small ­– to complete the same method. The large auger fills the bulk of the target fill and the smaller auger does the dribble or “trim” filling of the target amount. Now there is also a lot of programming that goes into the controls to make all of this happen in a smooth efficient fashion. This is where the T4000 controllers come into play. View more info about the T4000 here. Capturing the net weight of a dry material during the bagging process is done by filling a “bucket” inside the scale until the desired weight is met. The scale controls are only concerned with the weight of material that is in the “bucket”. Net-weigh feeding allows for faster bagging rates typically an increase of 1-2 bags per minute since you are doing two actions at the same time. The next weighment (volume of product being weighed) is dispensed into the bucket while a new bag is being placed or held in position. Capturing the gross weight of a dry material during the bagging process is done by zeroing out the weight of equipment and bag being placed on the discharge spout in programming. Gross-weigh feeding is typically slower than net-weigh feeding since you have to wait until the bag is filled and released from the spout before you can place another bag and begin filling. Quick re-cap, there are four ways dry materials are transferred when using open mouth bagging scales: gravity, vibratory, belt, and screw. The bulk and dribble feeding method along with programmable controllers increase accuracy. Net-weigh and gross-weigh feeding are the two scale weighing functions. Last but not least, the product and its flow characteristics determine which method is best and here at Magnum Systems we have the material handling experience to guide you in the right direction to achieve your desired results. To view more info about Magnum Systems’ Open Mouth Bagging Scales, please Click Here.